I wrote these photo quizzes for the Illinois Ornithological Society website from 2003 to 2010. All quiz birds occur or have occurred in Illinois, though they may not have been photographed in Illinois. 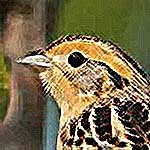 To see a list of the birds that have been recorded in Illinois, refer to The Birds of Illinois section on this website. Unless stated otherwise, all photos were taken by myself. The quizzes start with the Late Summer 2010 Photo Quiz, the last one I completed. All quizzes can be accessed from the dropdown menu below and on each quiz page. Note: The taxonomy used for some of the quizzes (e.g. wood warblers) is out of date. Except for a few minor modfications, these quizzes are presented as they originally appeared.